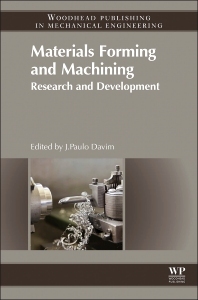 Materials Forming and Machining: Research and Development publishes refereed, high quality articles with a special emphasis on research and development in forming materials, machining, and its applications. A large family of manufacturing processes are now involved in material formation, with plastic deformation and other techniques commonly used to change the shape of a workpiece. Materials forming techniques discussed in the book include extrusion, forging, rolling, drawing, sheet metal forming, microforming, hydroforming, thermoforming, and incremental forming, among others. In addition, traditional machining, non-traditional machining, abrasive machining, hard part machining, high speed machining, high efficiency machining, and micromachining are also explored, proving that forming technologies and machining can be applied to a wide variety of materials. This book is aimed at undergraduates in engineering courses, for example, mechanical engineering, manufacturing, industrial and materials. The book is also aimed at academics, manufacturing researchers and other professionals in related industries with materials forming and machining.